Find and Book a Whitetail Deer Hunting Trip with a Professional, Pre-Screened Ohio Hunting Guide / Outfitter. Whitetail Deer (Odocoileus virginianus). 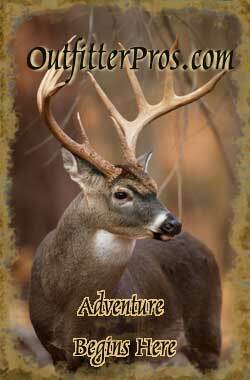 OutfitterPros.com features 12 Whitetail Deer Hunts with 6 professional Ohio Hunting Guides and Outfitters. All outfitters are licensed, insured, and have passed our exclusive 5 Point Rating system. These are renowned Ohio Whiteail Deer hunts with experienced Ohio Deer hunting experts. Archery, muzzleloader, and shotgun hunts for those heavy-racked Mid-Western trophy whitetails. Visit our Whitetail Deer Hunting page that provides detailed information on top Whitetail Deer hunting trips for all top destinations.